If Rep. Alexandria Ocasio-Cortez (D., N.Y.) had any concern her frequent attacks on the media were alienating anyone outside of Fox News, she need only watch five minutes of CNN on Sunday to be relieved. In a segment that was almost dizzying in its contradictions and apologia, here's what we learned: Spew bromides about journalism being the foundation of democracy, and you can attack, obfuscate and bungle the facts to your heart's content. Helps to be a Democrat, too, of course. On CNN's corporate media defense hour "Reliable Sources," host Brian Stelter and a decidedly unbalanced panel discussed Ocasio-Cortez's social media power, as well as the attention she attracts and her frequent barbs at the press who question her. My colleague Alex Griswold has already outlined the reason she keeps getting fact-checked: she says lots of incorrect things that need to be fact-checked. 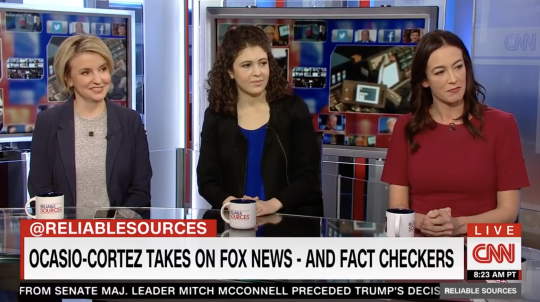 Time correspondent Charlotte Alter mentioned the "phenomenon of AOC" earlier in the segment, before Stelter pivoted back to her by asking what is "fueling the constant attacks on Fox against this freshman congresswoman?" Former HuffPost writer Laura Bassett's predictable, identity-politics ridden response, provides the answer: She's already quite influential, thus she is getting covered a lot! Look, she's got a target on her back because she ticks every box that makes conservative men uncomfortable [Jess McIntosh giggles]. She's a woman, she's Latina, she's young, she's working class, she's a millennial, she's a democratic socialist. Everything that makes people uncomfortable, and she's a star, she's a rising Democratic star. She's got a lot of power. People are really responding to her on social media, as Charlotte said, in the same way that people responded to Trump kind of emotionally a couple of years ago. So I think in some ways she's sort of the ideal anti-Trump and she is threatening white conservative men's power and they're terrified of her. Stelter wondered if there was something "Trumpian" about her deflections: to decry fact checks of her while claiming support for the press more broadly. This allowed Alter to say that Ocasio-Cortez hasn't called the press the "enemy of the people," so press members should appreciate the constructive criticism about the "biases that we do have in the media." "I think that she is in a unique position where she is getting a tremendous amount of scrutiny for a freshman congresswoman and is pushing back on the intense scrutiny," Alter said. "I think that she deserves to be fact checked. She is a member of Congress. … But I think that she's walking this line by sort of pointing out some of the biases that we do have in the media and also supporting the media as an institution and as an industry." We can’t simply accept the cliché that "journalism is dying." Journalism will only die if we choose not to fight for it – and if journalism dies, our democracy will, too. But why does Ocasio-Cortez get a pass? Like Trump, she hits back at her critics. Like Trump, she plays fast and loose with the facts. The answer is equal parts bias and tone. Trump's press attacks infuriate liberals and divide conservatives. While I have no problem with the media getting ripped when it gets things wrong, I get bored by Trump's "fake news" and "enemy of the people" jibes. They're not simply unbecoming of a president, they also fuel an insufferable bout of self-pity and heroism from the press corps. However, his presidency has also highlighted an astonishing amount of bias in the mainstream press, which has confused advocacy for journalism and commentary for coverage all too often in this age. When mistakes are made, they are only injurious to Republicans and conservatives. One need only look at how horrifically legacy outlets botched coverage of the Covington Catholic dust-up to see how much agendas have superseded reporting. Trump, for all his bluster, has been good to the press in many ways. For all the whinging about the lack of Sarah Sanders press briefings, his frequent impromptu press conferences are refreshing. His Twitter feed is a direct line to his brain unlike anything the country has ever seen from a president. But because of his politics and his charged rhetoric toward them—mocking the layoffs of reporters last weekend was nasty—there is no thoughtful mainstream analysis of his criticisms, only navel-gazing and melodramatic books about how "dangerous" it is to report from the White House lawn in a suit and tie. Comparing Trump and Ocasio-Cortez is imperfect. One is the president, the other a congresswoman with less than a month on the job. But studying the media reaction to their similar behaviors is a useful exercise. In a way, they are both winners. Ocasio-Cortez can lob grenades at the media all she wants so long as she remembers to say journalists are the saviors of our republic, and Trump will never run out of reasons to say the press is his enemy. This entry was posted in Politics and tagged Alexandria Ocasio-Cortez, Brian Stelter, CNN, Donald Trump, Media, Media Bias. Bookmark the permalink.